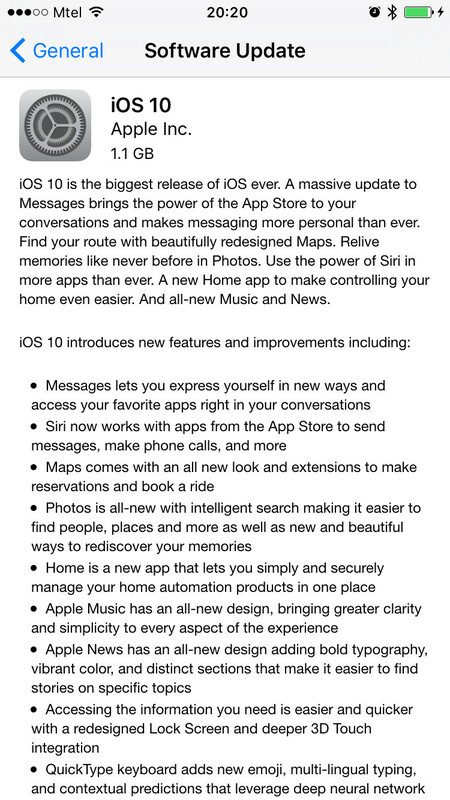 As promised, Apple has now released iOS 10. Available to a large number of iPhone and iPad models, this new version of the mobile operating system amounts to a massive visual and functional overhaul. At the same time, watchOS 3.0 has also become available to Apple Watch users. 'New software update' notifications on iOS usually don't pop up the minute they become available, but if you wish, you can always invoke the update process by opening the Settings app, and navigating to the General -> Software Update menu. If you have one (or more) of these, you can get nerdy right away and get down to updating their software. Since there may be quite a bit of waiting involved, though (iOS 10 is a large, 1.1 GB download), it might be a good idea to start the update process first, and then come back and browse through the gallery below, where we're rounding up all of iOS 10's major new features. And, if that download happens to be particularly slow, you may also want to read through our iOS 10 review, where we give you our first-hand impressions of Apple's new software. Drop a comment below to let us know how you like iOS 10 once you've given it a try! As the title here suggests, with iOS 10, iPhone users will be able to wake up the screen by just picking up the device. Using the gyroscope and accelerometer on the inside, the iPhone will be able to tell when that happens and wake the screen automatically. Since you won't be reaching for the Home button in this scenario, the previously mentioned new shortcut to the camera makes even more sense. While late to the party, Apple has finally found a way to make widgets on iOS truly appealing. As can be expected, this is the result of simply making the much smarter than you'd expect. For example, the ESPN widget was shown on stage to be able to give you a quick recap of latest sporting events, but upon expanding, showed even more information, including a video replay of a game. Pretty neat! This kind of widget functionality will be built into all 3D Touch-able apps on your homescreen. The menus that pop up in iOS 10 are considerably richer in functionality than their rather bland counterparts in iOS 9. With widgets getting this good, it obviously made sense to Apple to fill up the Spotlight/Siri pane on your leftmost homescreen with them. You can fill it up with as many of them as you want. Speaking of 3D Touch and lockscreens, these two will prove a mean combo in iOS 10. In short, notifications served to your lockscreen will be actionable through 3D Touch, but more importantly, you'll get a rich and functional preview. For example, 3D Touch-ing a new text message will open up a small window preview and let you directly reply inline. Alike to Android Pay, Apple Pay will be usable within mobile websites directly as a checkout payment option. This will significantly improve user experience so long as website owners integrate this promptly. A new Home app is being added to iOS 10 with the aim of making home automation even easier and more widely accessible. Instead of fiddling with a number of apps that all control different parts of your supposedly smart home, the Home app will serve as a... well, home to all these. So you can control your shades, lamps, air conditioning, and other, all from the same place. If you've ever used the fairly recently re-done Music app on iOS, you'll know that it was kind... confusing and cluttered. It could definitely do with a revamp. And that's exactly what Apple will deliver with iOS 10. Featuring a much simpler user interface, the new design isn't as busy and focuses more on the content that you care about most often. A shortcut to just your downloaded music has also been added, and that's hugely appreciated. Another fairly recent addition to the iOS core, the News app in iOS 10 has also been simplified and made easier to wrap your mind around. That's not all, however, for Cupertino is adding useful new features such as alerts, breaking news, and subscriptions to News. Taking cue from Google's eponymous app, Photos in iOS 10 feature some artificial intelligence goodness, allowing the app to recognize faces, objects, places, and others, and make those searchable. The app can also add these to albums containing images of specific people, trips, topics, and so on. The major differentiator with Apple Photos is its ability to work its magic offline—a privacy concern with Google's online solution. Like the Photos app, the built-in QuickType keyboard by Apple is also getting smarter. In iOS 10, QuickType will let you transition to different languages without manually switching between them (by recognizing the language you're typing in), and also serve up more relevant predictions and suggestions. So if a coworker texts you asking when you're free, with the help of Siri, QuickType will look through your Calendar and serve up relevant suggestions. This will also work with contacts—say your boss asks for that new guy's details, Siri will serve these up. Apple Maps is also getting some love. The biggest announcement concerns third-party app integration, which means that, in iOS 10, users will be able to directly book a table or hail a ride with Uber right from the Maps app itself. Another major announcement concerning Siri is its transition from closed-off to developers to open. Starting with iOS 10, any third-party app developer will be able to leverage Siri's smarts within his or hers creation, potentially offering superior experience to users of the app. Messages is the most used iOS app according to Apple, and, respectively, is the subject of the most attention from the company in iOS 10. One new feature in Messages is a lot alike to what you can do in Facebook Messenger: control the size of the thumbs-up sticker. Instead of just thumbs-up, however, in iOS 10 users will be able to 'whisper' or 'shout' (that is, make smaller or larger) by controlling the size of the chat bubble. Neat! Another, rather questionable at this point, new feature is handwriting input. If you're feeling like paying someone special attention, you can go for a handwritten reply that will be animated in real time for the recipient. Of course, the beautiful cursive shown in the image here is unlikely to end up being your reply to people, you fat-fingered you! Another cool new feature with Messages are effects. These can be, for example, birthday balloons or celebratory fireworks, and will serve to boost your street cred among friends and colleagues. Silly effects aside, this one is actually pretty nifty: Invisible Ink in Messages means that you can send and receive texts and photos that are blurred out at first. To reveal them, you simply swipe over them for a short preview before they're engulfed into a cloud of blur once again. Can't wait for the inevitable shocker moments that are sure to be uploaded on YouTube. Tapback is Apple's way to let us know that, in iOS 10, the Messages app will let you reply inline with a choice between six quick replies, including timeless classics such as "Ha-Ha! ", "!! ", "? ", and of course, the obligatory thumbs up and down. Shocker, we know, but stickers will finally make an appearance on Apple's Messages app. You can swap these on top of chat bubbles, photos, and even on top of each other. That last one presents some creative opportunities, but we'll have to wait and see how it works. With so much love showered on Messages, it'd be a shame if Emojis didn't get some attention. They did. Not only will Emojis be three times the size they are right now for better viewing, but Messages will also let you tap on top of words within your reply that have a corresponding Emoji and quickly exchange them. As an Apple exec said on stage, the kids of tomorrow won't know English if we keep going at this rate. Messages and... Emojis, of course! Everything is good except my iphone and every iPhone user's screen looks the same. I'd prefer to customise it. Give it a week, all the stories of crippled older devices will be out in force. I doubt it. I updated my 5s and it's running just fine. Same for android updates, and those come extremely slow and rare. Well obviously, a staged roll out is a much better solution. It isn't as flashy as an all out release but it is more responsible. Every expert in the field has recommended that to Apple due to the numerous problems in every iOS launch but Apple directly benefits from it so they probably won't do anything about it. Everyone blames their device for the fault because it is old and think they need to buy a new phone if things get too messed up so Apple makes out like a bandit. So can we say the same about the entire marshmallow update and a every manufacturer that make up the .01 percent actually running the horrible M? I guess while we're at it, lollipop can be put in there as well. Didn't the newest N update get pulled back too? Don't know if you're having a stroke or you just have terrible sentence structure, but I assume what you're saying is that, can we apply the same concept to all recent Android updates? If that is what you are saying, then I am happy to inform you that Android releases are done in stages and the concept was already being utilized with Android updates since 1997. Unfortunately I'm using my work galaxy s5 for the week to post until my iPhone arrives on Friday. If you can't put together what I said though, you have worse issues (as evident through your posts) than a stroke- mental instability. Than get a damn android. iOS isn't about "pimping your ride" it's a tool to get things done a different way. Funny cause all those "updates" they're making, android phones have had it for years now. Android phones are getting updates 2 years late - so in hindsight about the same time. But your blind fanboyism font let you see that with every android also added iOS features. Yup, agreed with u. iOS is for the slaves who are willing to give their soul to apple so that the master can do whatever he likes. I don't see any iOS users getting so offended as android users though. Who is the sheep genuinely butthurt? You guys treat this like it's honestly offending you. iOS 10 won't allow you to customize it to your taste. But I wish there was option to choose between slide-to-unlock and unlocking by pressing home button. Guys don't update your iPhones right now because many users are complaining that their iPhones are being put into recovery modes which wipes all their data and you have to recover your device via iTunes. Don't do it especially if you have iPhone 6s/6plus, iPhone SE or the iPad pro Kindly wait for a fix. For more details visit MacRumors. I hope it's not true for everyone since I just put an iPhone 5 to update. You can wish RIP to your iphone 5 by now. Updated nicely just hours ago. Sorry to ruin your day. Already updated my 5s -no issues, took only a few minutes. Will update my 6s and my wife's 6s as soon as I get home. The problem is mostly occuring in 6s/ 6s plus. Do tell if you have any issues. Thanks. Yes. It is true.after updating my SE , it is asking to connect to itune. I do not have access to computer right now. So i will have to wait till tomorrow to recover it. Initially i thought there was a network issue while downloading , so my update crashed. But it seems many users are facing the same issue. My advice to those who have not updated would be to wait for few days.